What’s Our Overhead Look Like? “Over our heads” in the master bathroom. I’m talking about the ceiling. It used to look like this bumpy, rusty nastiness…. 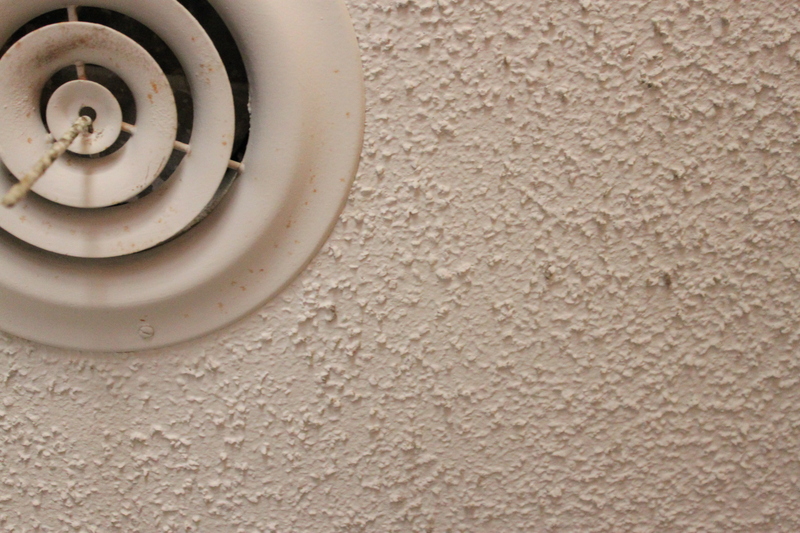 Anybody who willingly sprays “popcorn” on a ceiling should be shot on sight. It took Jamie an hour to scrape all that crap off. True Cavender Diary fans will remember Jamie scrapping the popcorn off the master bedroom ceiling the first week we were in the house 5 years ago. He’s a pro at it by now, even made himself a stylish trash-bag-poncho. Lying on my back and looking up…this is the view after Jamie finished. 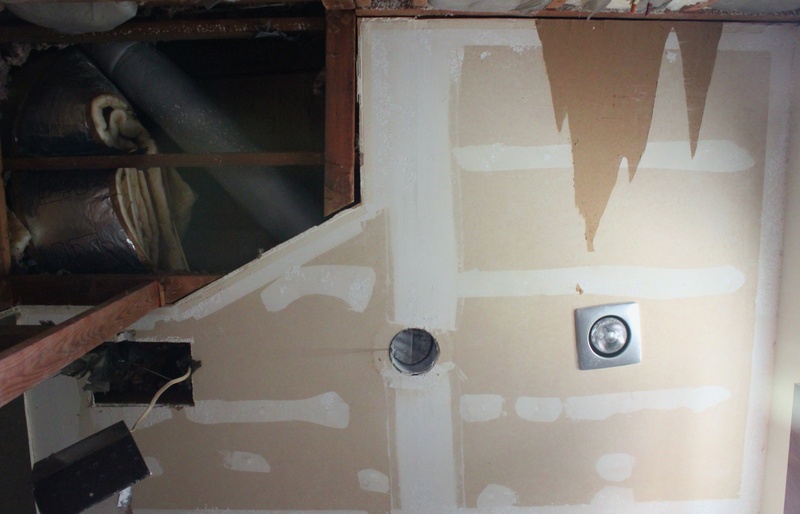 Since there were just too many holes, from the heat lamp, vent, fan…..and nothing over the shower, my brother Ben and I decided that the best plan of action was to just add a fresh layer of drywall over all the existing ceiling. Follower by 2 coats of latex primer……. I’m enjoying this. I’m a little bit ahead of you on refinishing my teenager’s bath. 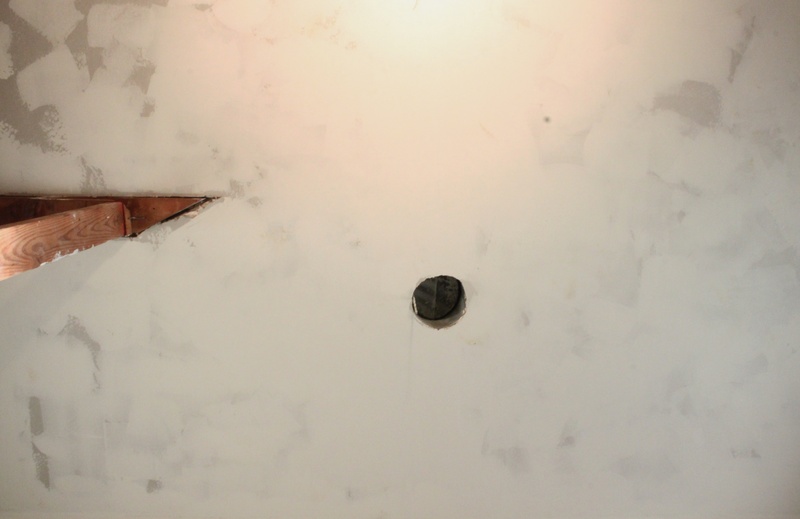 I painted the ceiling today. Next time ya’ll need a disposable poncho, you can get them at Dollar Tree for $1. 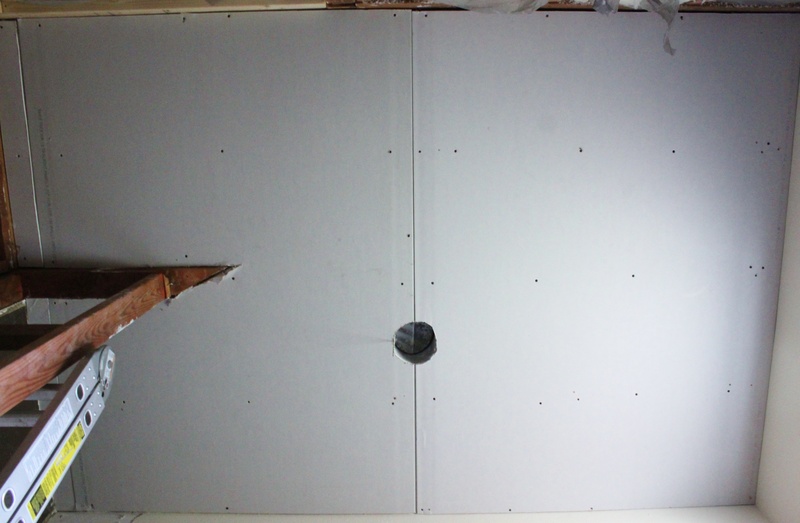 Did you use the new lightweight 1/2″ drywall? It’s a little easier to fight with. 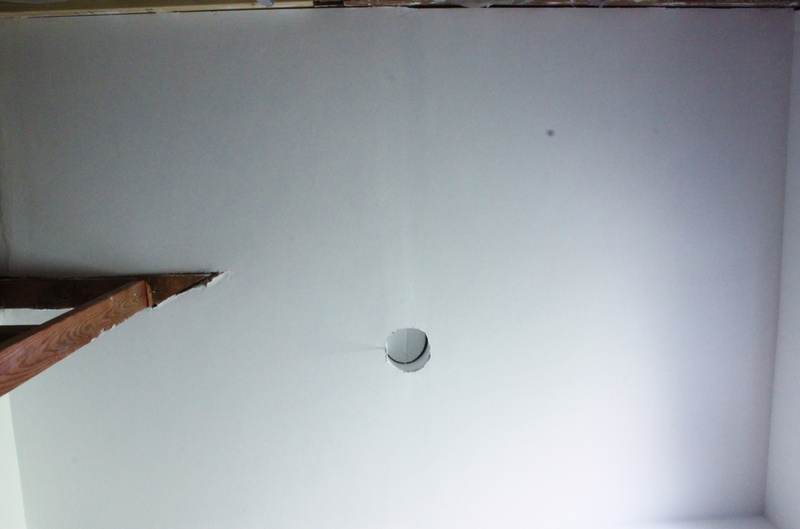 We did use the lightweight drywall…..it’s the cement board that’s killing us. Luckily it’s only in the shower…some people use it for the whole bathroom. OMGosh that looks wonderful! We are just plain SCARED to do ours! One of us will end up crushed, i am sure…probably the little one! Great job! Took us 5 year to build up the courage…glad we did….But someone, not naming any names (It’s Jamie) is already shopping for bathtubs for the other bath…. Brings back memories of doing the same 15 years ago. Never again. My strength of youth is gone. 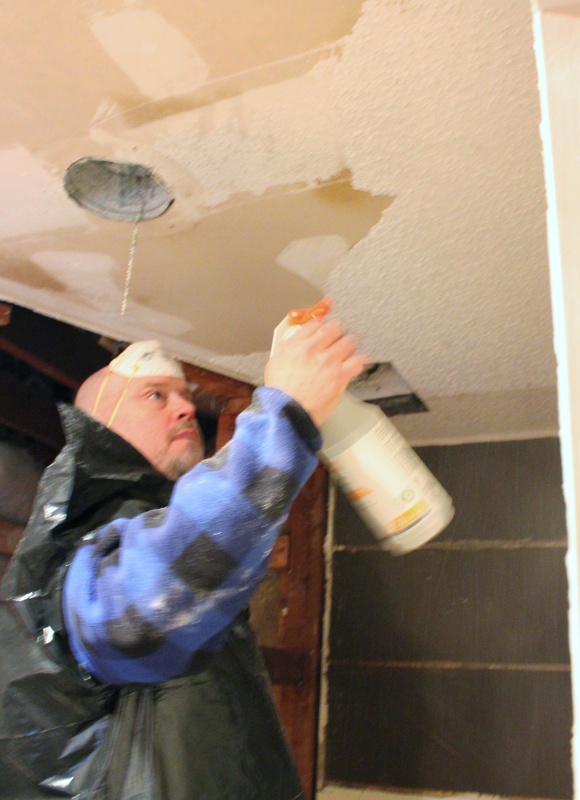 Not only did we have popcorn ceilings by walls too! Good job. Popcorn walls!!!!!!! Good Grief!!!! Ours were textured, but not too much. It’s been a combo of sanding and mudding that’s made them beautifully flat.